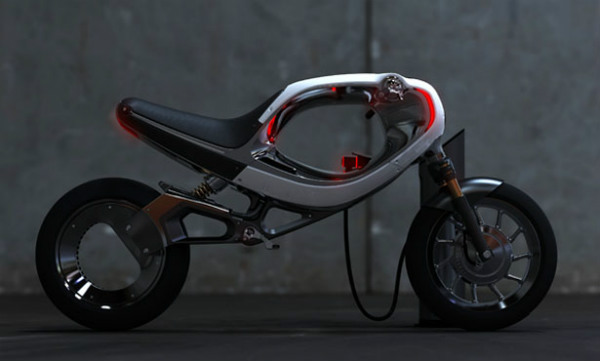 Frog ebike is designed by Frog Design. 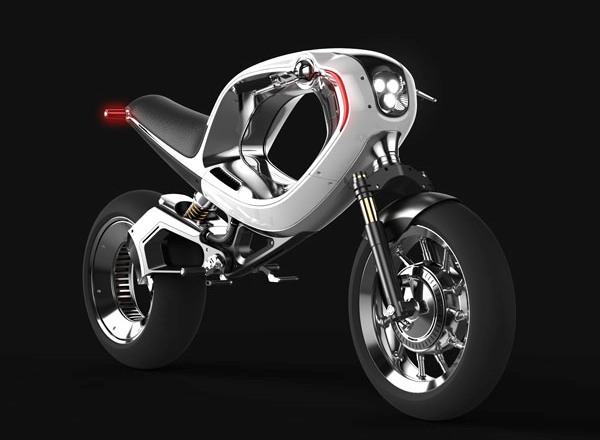 This bike is designed to overcome to problems and the complex system we have with the fossil fuel powered motorcycles we know today. 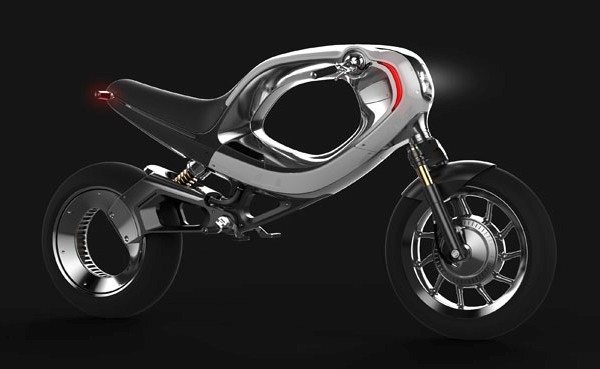 This ebike is less complicated, and the design can become more expressive. 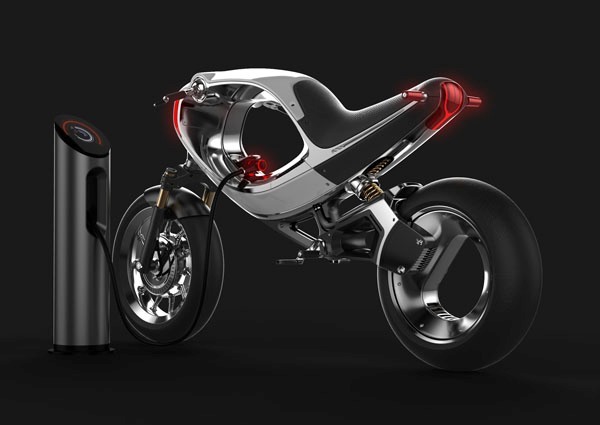 This is Inspired by this heritage of motorcycle design (including frog’s own 1985 frog FZ750 Rana concept), and the promise of new electric vehicle technologies.This ebike is replacing the traditional combustion engine and its related systems. The large mass of the combustion engine, formerly a defining feature of a motorcycles profile, is now a symbolic void. The new electric motor’s copper coils moved inside a hubless rear wheel, at once streamlining the motorcycles composition and providing for a highly efficient and direct transmission of power. It has become an ergonomic affordance for the rider, a support underneath and in front of the rider hugging his or her bike at great speeds. 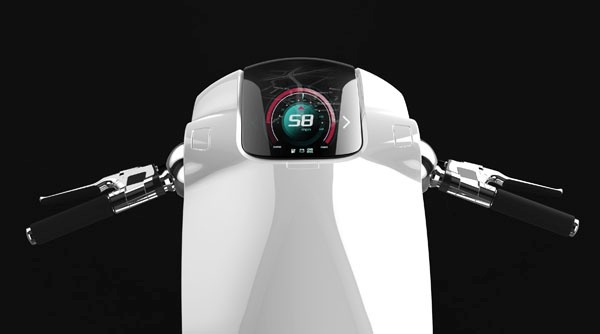 This design element provides a continuous formal transition from the back of the seat to the front of the instrument cluster and down around the void, transforming into the new location for the bikes fuel: the batteries. The entire bottom chassis is dedicated to storing battery cells. This location lowers the bikes center of gravity, creating an extremely stable ride. Because the motorcycle’s speed is controlled directly by the power to the electric motor, virtually all other major mechanical components of a traditional motorcycle are no longer required. 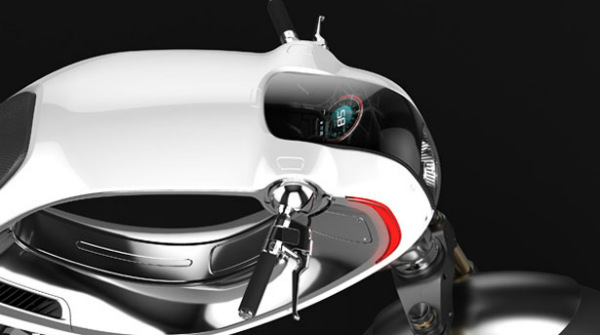 Fly-by-wire steering, full OLED digital instrument panel, full time connection to the cloud, and a helmet with heads-up display and retina tracking complete the trip into concept territory.